New York, Feb. 23, 2014 (Xinhua) -- The United Nations Security Council votes on a draft resolution regarding the situation in Syria, at the UN headquarters in New York, on Feb. 22, 2014. UNITED NATIONS, Feb. 22 (Xinhua/Sun) -- The UN Security Council on Saturday unanimously adopted a resolution which demands "rapid, safe and unhindered humanitarian access" of UN humanitarian aid in war-torn Syria, where armed conflict has been going on for nearly three years. "The Security Council demands that all parties, in particular the Syrian authorities, promptly allow rapid, safe and unhindered humanitarian access for UN humanitarian agencies and their implementing partners, including across conflict lines and across borders, in order to ensure that humanitarian assistance reaches people in need through the most direct routes," the resolution said. The 15-nation UN body started an open meeting at around 11:15 a. m. EST 1615 GMT to vote on the draft resolution presented by Australia, Jordan and Luxembourg, three of the 10 non-permanent council members, and backed by Britain, France, the United States and South Korea. Britain, France and the United States are three of the five permanent council members and South Korea is another non-permanent member. Immediately after the vote, UN Secretary-General Ban Ki-moon told the council that "I very much welcome the adoption of this resolution." "We are all keenly aware of the profound and prolonged desperation of the Syrian people," he said. "If this resolution is implemented quickly and in good faith, at least some of the suffering can be eased." Last week, Valerie Amos, the UN under-secretary-general for humanitarian affairs, called on the Security Council, the most powerful UN body in maintaining international peace and security, to "use their influence over parties to ensure they abide by pauses, give humanitarian access, commit in writing to upholding international humanitarian law." The resolution said, "The Security Council urges all the parties, in particular the Syrian authorities, to take all appropriate steps to facilitate the efforts of the United Nations, its specialized agencies, and all humanitarian assistance to the affected people in Syria, including by promptly facilitating safe and unhindered humanitarian access to populations in need of assistance in all areas under their control." The Security Council also "encourages further cooperation between the United Nations, its specialized agencies and all parties concerned, including Syrian civil society organizations, to facilitate access and the delivery of assistance in the entirety of the Syrian territory," said the resolution. The resolution "demands that all parties immediately put an end to all forms of violence, irrespective of where it comes from, cease and desist from all violations of international law and violations and abuses of human rights, and reaffirm their obligations under international humanitarian law and international human rights law, and stresses that some of these violations may amount to war crimes and crimes against humanity." "The Security Council demands that all parties immediately cease all attacks against civilians, as well as the indiscriminate employment of weapons in populated areas, including shelling and aerial bombardment, such as the use of barrel bombs," the resolution said. "The Security Council calls upon all parties to immediately lift the siege of populated areas, including in the Old City of Homs (Homs), Yarmouk (Damascus), Eastern Ghouta (Rural Damascus), Darayya (Rural Damascus) and other locations," the resolution said. At the same time, the Security Council "also demands that all parties allow the delivery of humanitarian assistance, including medical assistance, cease depriving civilians of food and medicine indispensable to their survival, and enable the rapid, safe and unhindered evacuation of all civilians who wish to leave," the resolution said. The resolution expressed "grave alarm at the significant and rapid deterioration of the humanitarian situation in Syria, in particular the dire situation of hundreds of thousands of civilians trapped in besieged areas, most of whom are besieged by the Syrian armed forces and some by opposition groups, as well as the dire situation of over 3 million people in hard-to-reach areas. " More than 1,370 people have so far been evacuated from Homs since Feb. 7, UN spokesman Martin Nesirky told reporters here earlier this month. Some 2,500 Syrians have been trapped in Homs without outside aid for nearly two years in what has become an iconic symbol of the suffering endured by civilians in the war's relentless bombardments and sieges. 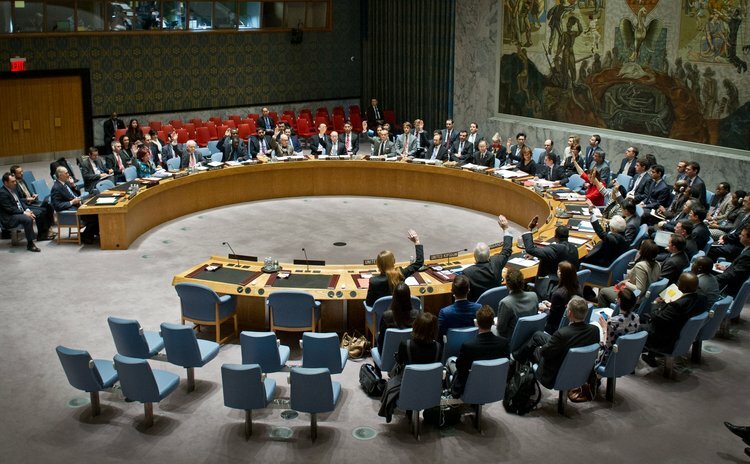 "The Security Council stresses the need to end impunity for violations of international humanitarian law and violations and abuses of human rights, and reaffirms that those who have committed or are otherwise responsible for such violations and abuses in Syria must be brought to justice," the resolution. The Security Council is "being appalled at the unacceptable and escalating level of violence and the death of well over 100,000 people in Syria, including over 10,000 children" since the outbreak of the Syrian crisis in March 2011, as reported by the secretary-general and other senior UN officials, the resolution said.